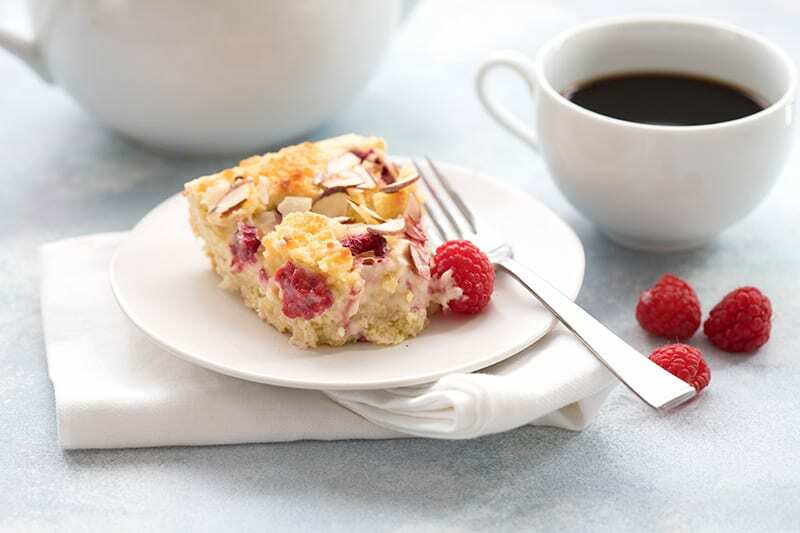 Tender low carb coffee cake with a delicious filling of cream cheese and fresh raspberries. A perfect addition to any holiday brunch. 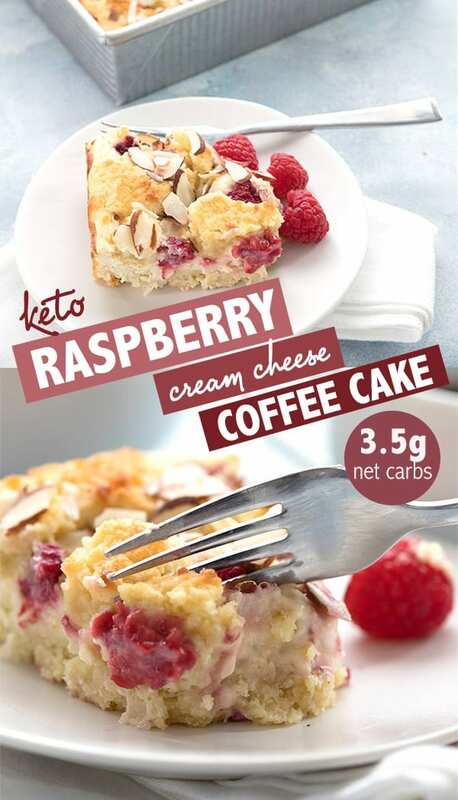 This keto cream cheese coffee cake is sure to please. Now with an instructional video. This post is sponsored by Bob’s Red Mill. 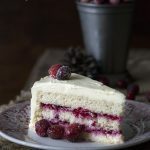 This raspberry cream cheese coffee cake recipe was first published back in 2014. It’s a perennial favorite so I thought it would be good to give it an update with a how to video. It’s just as delicious as ever! You know what makes me incredibly happy? The fact that raspberries fit well on a keto diet. I’ve loved raspberries the mostest, since I was a tiny tot. It would be very difficult for me to give them up for good. Most berries are pretty low carb as it is, but raspberries have the lowest net carbs overall. At 7.5g carbs and 4g fiber, you can easily enjoy a half cup of raspberries and stay well within your macronutrient goals for the day. Add a little whipped cream for an astonishingly delicious and easy snack or dessert. 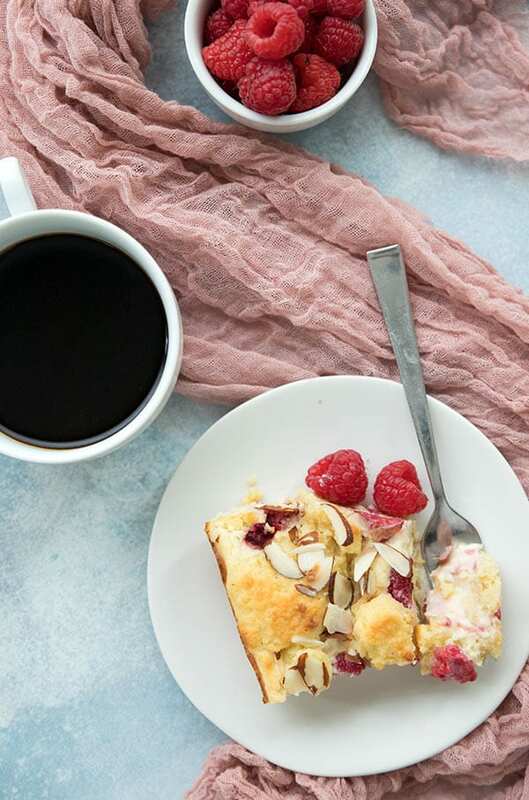 But if you want to get a little fancier with your raspberries, look no further than this Raspberry Cream Cheese Coffee Cake. There really isn’t anything better. And with Mother’s Day coming up, this may be the perfect keto brunch recipe! Love raspberries as much as I do? Check out my Raspberry Coconut Fat Bombs and my Raspberry Almond Thumbprints. 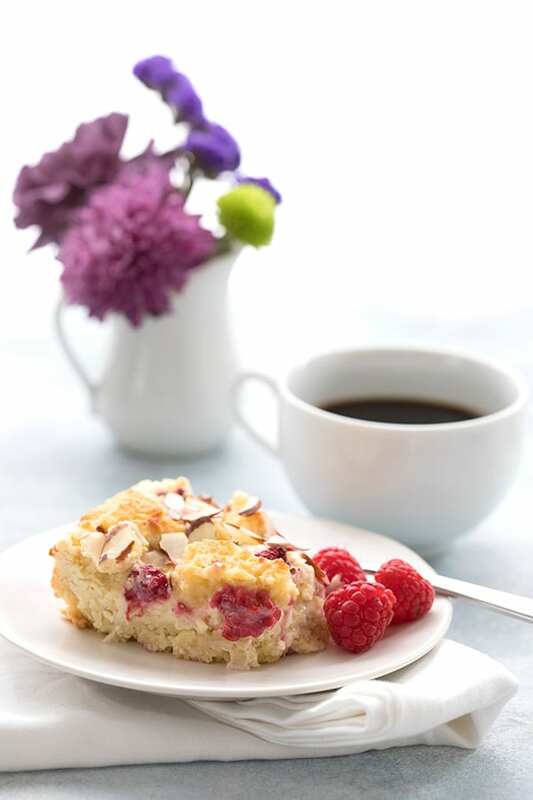 Coffee Cake with Fresh Raspberries! 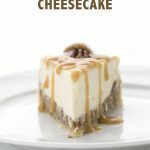 This delicious low carb recipe is an almond flour coffee cake with a cheesecake filling. It’s really not hard to make, but here are some tips for success. Use good blanched almond flour. I always use Bob’s Red Mill because I know it produces consistent results for my recipes. This cake is actually made with both their almond flour and coconut flour. Make the cake batter first, and spread two thirds of it in a prepared baking pan. I used a 9×9 metal pan. Be sure to spread the batter all the way to the edges of the pan. My favorite tool for this is my little offset spatula from Ateco. It’s one of my most useful kitchen tools and it only costs $5! Check it out HERE. Prepare the cheesecake filling and pour it over the cake batter, and spread it to the edges as well. Then dot the raspberries over. If you want to cut back on the carbs a little, use just a cup of raspberries. Fresh raspberries are best, because they don’t bleed as much during baking as the frozen ones. But you can use frozen and the end results will be just as delicious. Take the cake out when the top is golden but the center still jiggles a little bit. This ensures that your cheesecake filling won’t be overcooked and too hard. This should be ooey and gooey! I flavored my batter with almond extract, because almond and raspberry is a dreamy combination. But if you want to stick with vanilla, that’s fine too. 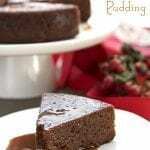 As for sweeteners, you can use your favorite granulated sweetener for the cake. The filling can work with either granulated or powdered sweeteners. 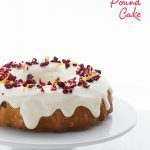 Want to make a dairy-free cream cheese coffee cake? Coconut oil works well for the butter and Kite Hill Almond Milk Cream Cheese is great in the filling! This seriously is a dreamy keto coffee cake recipe. It hits all the right notes, tender cake filled with creamy cheesecake and raspberries. Trust me, you’re going to love it! 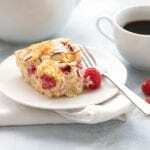 Low carb almond flour coffee cake with a ribbon of cream cheese and studded with fresh raspberries. This might just be my most popular keto coffee cake recipe! Preheat the oven to 325F and grease a 9-inch square baking pan (you can also use an 8x8 pan, but you will need to bake the cake for longer). For the cake batter, combine the almond flour, coconut flour, baking powder, and salt in a medium bowl. In a large bowl, beat the butter with the sweetener until well combined. Beat in the eggs and almond extract. Beat in the almond flour mixture until combined, scraping down sides of bowl and beaters as needed. Beat in the almond milk until well combined. Set aside while making the filling. For the filling, beat the cream cheese with granulated sweetener until smooth. Beat in the egg and vanilla extract until well combined. To assemble the cake, spread about two thirds of the cake batter in the prepared baking pan, smoothing the top with a knife or an offset spatula. 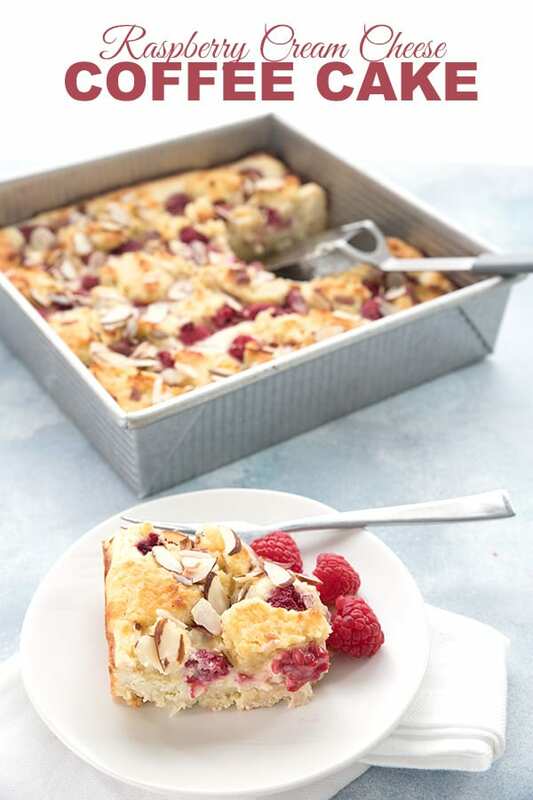 Pour the cream cheese mixture over batter in pan and sprinkle with raspberries. Dot the remaining batter over the filling in small spoonfuls, allowing some of the filling to peek through. Sprinkle with sliced almonds. Bake 35 to 40 minutes, or until top is light golden brown and filling is just set but still jiggles slightly in the middle. Remove and let cool completely, then transfer to refrigerator to chill for at least 1 hour. 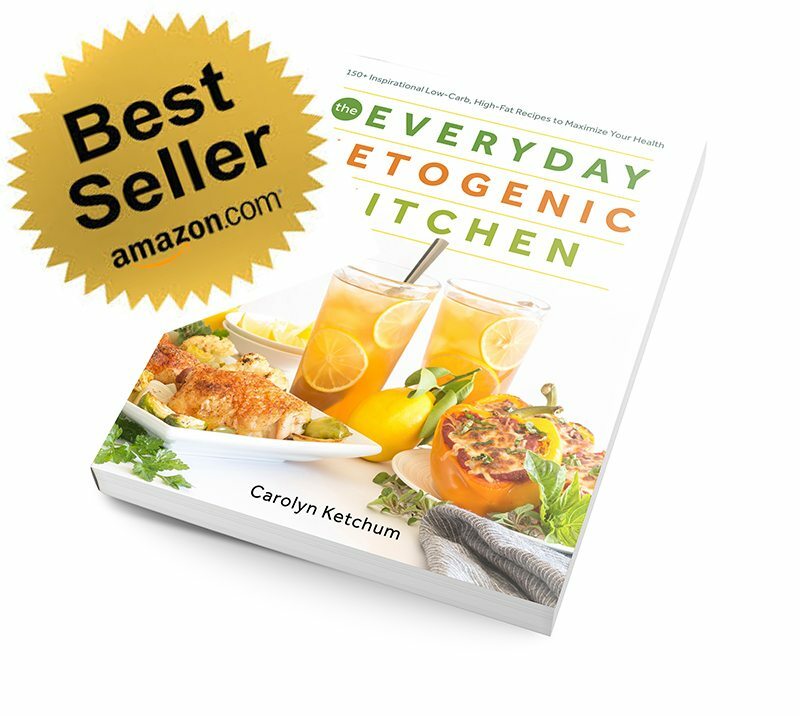 WOW – another fabulous delight – thanks for sharing all your wonderful recipes with us Carolyn!! Question – what would 1/2 t liquid stevia extract be equal to in sweetness? I usually use liquid sucralose when liquid sweeteners are called for and I’m very confused with all the different stevia products. Can’t wait to try this! Thanks again!! It would be about 1/2 cup sugar in sweetness. Have you tried Nectresse or liquid monk fruit? No calorie and natural. Is the equality the same? 1/2 tsp liquid = 1/2 c sugar sub granulated? Thanks! I don’t know how it equals sugar, I think you’d have to research that one a bit. Sorry! This looks amazing Carolyn! One of Mr. Hungry’s favorite treats is the junky raspberry cheese danishes you can buy in the store – I bet this tastes so much better, not to mention that it’s so much healthier! Definitely making this one SOON! This looks great. I am so excited for berry season. Hopefully not too much longer till pick your own. I made this today!! Only thing I changed was I didn’t use erythritol in the cream cheese mixture, I did 1 mashed banana instead….and I used blueberries…everything else I kept the same. Mainly cause I had 1 banana I had to use, and I already had blueberries in the fridge not raspberries so I didn’t have to go to the store for anything lol. So glad you liked it. Your blog is great, by the way. I put up some of your meatballs (just image and link) on my Facebook page and they were well received. Hello Carolyn, I have been a long time lurker but have made a lot (if not most) of all your lemon recipes (HUGE fan of lemon and found all the recipes amazing). I have some very few questions: Do you use bob red mills coconut flour? I have tried and experimented with this flour but I am just not a fan not sure if it is just red mills orrr…..
Can I use all almond flour and skip the coconut flour part in this recipe? is there a particular coconut flour brand you bake with and recommend? Thanks for putting out such an amazing site! I do use Bob’s actually, it’s the only one I use. 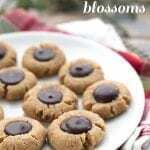 But if you want to go all almond flour, do 3 full cups for this recipe. Hope that helps! 16 servings if it’s not the only think you’re eating for Mother’s Day brunch! I made this coffee cake in the morning and now after having a piece Im here to say a Big Thanks! I couldn’t resist and tried it before it was completely cooled in the fridge and its great. 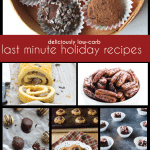 I cant believe it a low carb treat. I didnt have stevia so I only used the erythritol that is required in the recipe and to my surprise is lovely sweet, I think good quality raspberries helped a lot! I made this for mother’s day and it was delicious! Thank you!!!! I made this tonight and just swallowed a piece. I couldn’t wait for it to chill in the fridge. This will be one to print. So ONO! Thats delicious in Hawaiian. Wish I could post a pic. Gonna try it with blueberries. Can’t wait for morning to have another piece. I over baked this by 45 minutes, as I (forgot) and drove my sons friend home. The cake was still wonderful. Can’t wait to make it again, and see how proper timing affects it! Is there a better way to print the recipe from the Live Better America site? I don’t see a print friendly button and it is 19 pages! Just checking with you before I print it out. If I were you, I would cut and paste it into a Word Doc. If you can’t do that, then email me and I can send you the original word doc. Is there any other way to get this recipe? I’m in Australia and when I click the link it redirects me to the Betty Crocker website! If you have 20 mins, follow the link. If you don’t don’t bother with this BS. I’m sorry but I find that quite rude. The recipe was on Live Better America for quite some time. I knew that they had folded but was assured that the recipes would stay up indefinitely. I only *just* found out a few days ago that they are no longer on there and am working to put the recipes up on my own site. You simply could have asked me for the recipe, I have emailed it to several people already. Carolyn, I just made this yesterday and couldn’t wait for it to cool… OMG this is the best ever! It seriously has the “mouth feel” of real flour. I can’t wait to try it cool 🙂 Thank you so much for your wonderful recipes! BTW, I had extra raspberries (they were BOGO) so I made a double batch… have you tried freezing it after it’s been cooked? How do you think it would fare? I think it would freeze okay. The cream cheese center might change a bit. 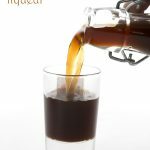 I have everything to make this, but the liquid stevia. What does it bring to the recipe? Is it necessary? It looks great! Thanks for a wonderful recipe! Just more sweetness without bulk. But you could add more Swerve if you need to. I made this recipe tonight. The cream cheese filling and raspberries sold me! It’s a pretty easy recipe to make, which I love. I replaced the liquid sweetener with a sugar free hazelnut syrup because that was all I had on hand. After baking I couldn’t wait for it to cool and then cool some more in the fridge; so I ate some five minuets after taking it out of the oven. I added whipcream and ate it like a warm mushy cobbler; it was delish! After cooling and letting it set up it was even better! Thanks for making our low carb lifestyle easier. I made this and it was absolutely divine!!!!! Thank you for sharing! I am going to try and make these into cupcakes! After seeing the picture, which looked so good I could almost taste it, and reading through the reviews, I decided to make this. I would love nothing more than to add a great review, but this recipe didn’t turn out anything like I thought it would. It came out dry and basically tasteless. I am sooo disappointed! I am not a novice cook so I really don’t know where I went wrong. I used almond meal, which is what I always use in other recipes and they come out fine, so I don’t know if that could be the problem with this recipe. It appears this recipe was made with blanched almond flour. I honestly didn’t think there was much difference between blanched almond flour and almond meal. Maybe this recipes needs the blanched stuff. Thanks, Carolyn. I’m pretty sure it was the almond meal that messed up the recipe after reading that there definitely is a difference. Yup! I know it’s not cheap but if you can get your hands on some, it makes a big difference. Honeyville is a great one. Any suggestions for substituting sugar free raspberry jam for the fresh raspberries? Thanks in advance! Wow! Delicious! I heated 2 tbsp sugar free jam in the microwave so it was runny, and drizzled it on the cream cheese filling. Then swirled a bit with a toothpick. And I sprinkled a few Lily’s chips into the filling as well. Love that almond flavor. Sounds like a great adaptation! I know this is heresy, and I truly do apologize, but I’m wondering if you would be willing to give me the amounts of AP flour and regular milk that would be needed. The recipe sounds sooo good. Thank you! Sorry, I simply have no idea for the regular flour. I don’t use it at all anymore and barely remember how to bake with it. Surely there is a similar recipe out there that’s more conventional…I’d google it and see what you can come up with. Any suggestions on the amount needed for THM baking blend instead of almond and coconut flour. I am afraid I haven’t tried that in this recipe. You could do a direct substitution but THM baking blend is drier so I would be prepared to add more butter and a little more liquid. I tried this with 1.5c of THM Baking Blend and the consistency seemed perfect in comparison to the video. Thank you for posting this. I’m looking forward to eating it in the morning. How did the 1.5c baking blend substitute turn out, now that you’ve tasted it? Made this today with the frozen blackberries I had since icy roads kept me home and all I can say is yum yum yum! A tasty reminder of last summer on a cold icy day. Easy and fantastic. I know higher carbs cause blackberries but that’s ok with me today! Thanks for the recipe! Great as always. I have one baking right now. Didn’t have raspberries so I subbed cranberries that I cooked down with Swerve and Sukrin gold syrup. Can’t wait to try another one of your awesome recipes! I made this and it was delicious. It came out just as pretty as your picture. I used Honeyville almond flour and it came out perfect. Even my carb eating family had some. It was not overly sweet, which is how I like it. Thanks again! Do you think frozen raspberries would be ok , that’s all I have at the moment? Thanks for all your great recipes by the way. 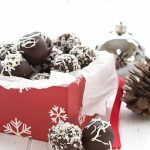 It seems like this recipe was posted years ago, but here I am on the beginning of my low carb journey in 2017. This cake is INCREDIBLE. I could eat the entire pan. It satisfies every ounce of craving for something cakey and sweet. Thank you! This is a wonderful recipe. I have several gallons of frozen blueberries in the freezer so that’s what I used and it turned out great. It was so moist and as others have admitted, I also had a taste before cooled completely. Infact, making another to take to friends house this weekend! Thanks for a winner! Can you please help me!? I don’t understand why most low carb recipes require you to use more than one type of sweetener. Why can’t I just use splenda for my baking? If I can use Splenda, do I substitute cup for cup? Nothing requires it, but many people find that the flavour is better when you use two sweeteners. Plus it’s often cheaper that way. If you want to use Splenda, try 1/2 cup in the crust and 1/2 cup in the filling. I tried this recipe and it turned out very well, thank you! One question though…. it took me 1.5hrs for the cake to set……… any idea what could’ve gone wrong?! thanks!! That is very strange, and I’ve never had another reader say anything like that. Have you checked your oven temperature lately? OH!!!! I think I know why now, I used a loaf pan (23*9.5*H8.5) instead of a square one. Another absolutely excellent recipe, Carolyn ! ! 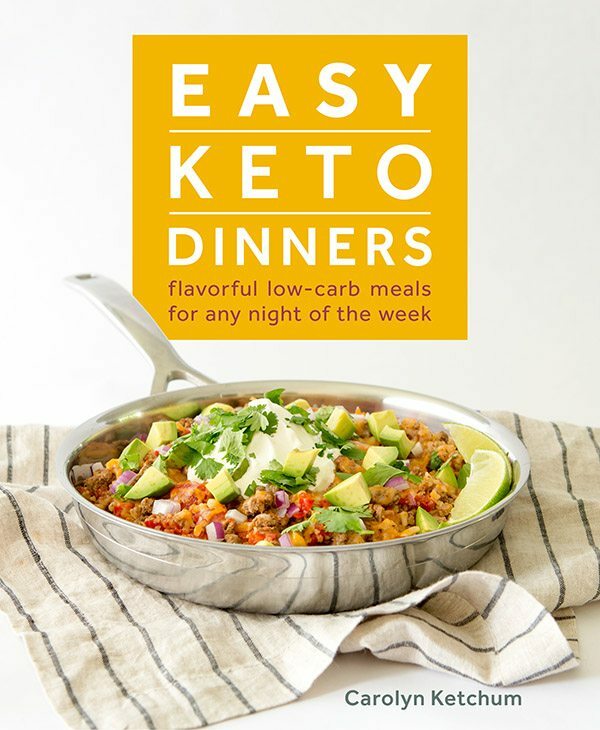 You have the most dependable keto/low carb recipes of anyone. 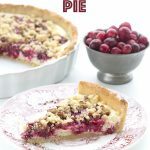 That’s why I splurged on out of season fresh red raspberries for this tasty recipe even though it was my 1st time making it. Maybe next time I’ll try it with another fruit for fun. 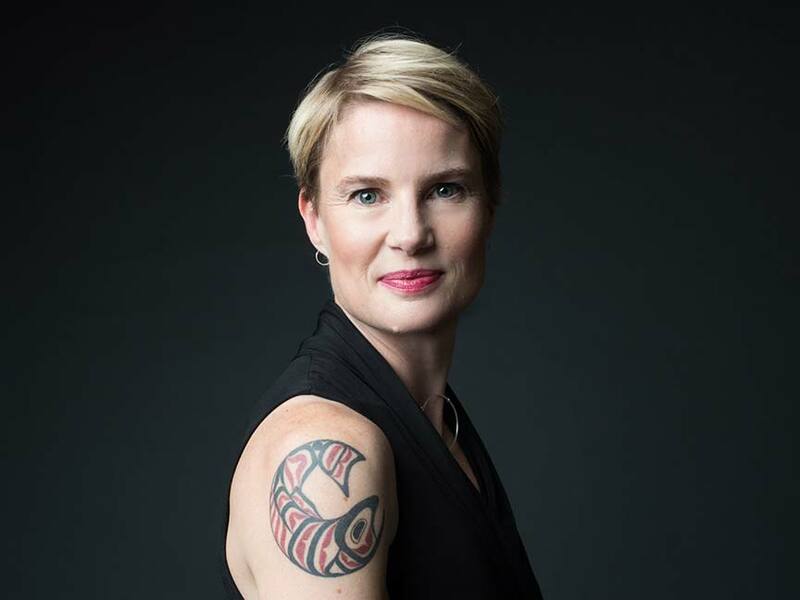 Dear Carolyn, I love your blog because your recipes are so relyable! I made this cake last week and I’m going to do this weekend again. While I was preparing it I forgot to save the batter for the crumble part. To fix it somehow, I made a coulis with the berries I already had (different shapes and sizes), and I made some swirls on the cream cheese layer. Wonderful! I think is a great base for many variations. Thank you for your amazing work! Wonderful recipe again! Thank you so much, Carolyn! I did find that my cream cheese layer melts into the base instead of staying separate. I wonder if I baked the bottom layer for a few minutes to “set it” if the cream cheese layer would remain separate, yet ” glued” to the base. What do you think? Thanks! It shouldn’t “melt” into it at all so it suggests that your cake batter isn’t thick enough. Try adding a tbsp or two of coconut flour. Thanks! I will definitely try your suggestion. I’m not letting this delicious recipe go! 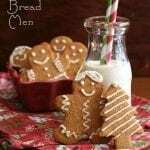 Carolyn, this is one of my favorite recipes I have tried from your blog. I’ve made it 3 times now and the recipe is delicious, consistent and easy. I brought this to a bbq and served it to friends that are not low carb or keto dieters and they devoured it. No one was able to tell that it is low carb. It does take a little longer for mine to bake since the center is quite jiggly within the time frame the recipe calls for but my oven temperature is a bit low. 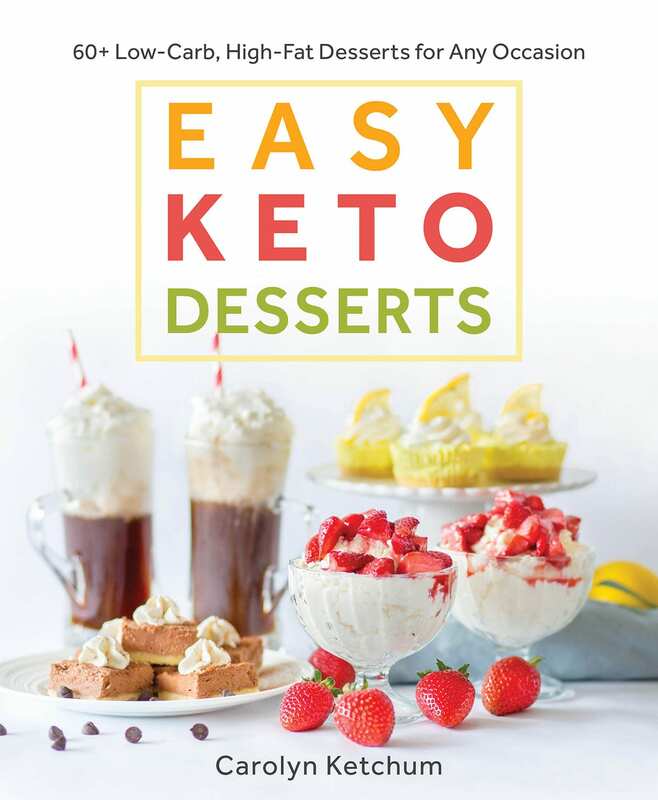 Thanks again for an amazing dessert that I can enjoy and keep on track with my keto lifestyle. Oh my goodness! 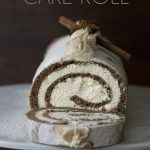 I have been low carb for several years and have made countless low carb desserts, but this may be one of the best ones! I did have to add an extra egg as the brand of coconut flour I was using seemed to require it and it turned out phenomenal. 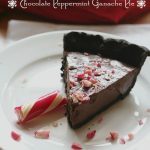 My husband and I can’t decide if it’s best for breakfast or dessert… or perhaps both! But either way, it won’t last long LOL Carolyn you put together incredible recipes – thank you so much! Those should work but I am not sure of the amounts. I made this and it was absolutely wonderful! My young adult “kids” ate it all up. Another winner! This is my fav keto desert recepie, I made it almost weekly and my husband and son (they don’t do keto) love it…I use 1 cup of vanilla atkins shake instead of 1/2cup of almond milk and 2tsp of sugarfree strawberies preserve instead of fresh rasberies and taste delicious!!! Sure it would probably be tasty! This looks delicious! I will definitely try this one. However, currently the recipe says ‘1/2 tbsp butter’, which I’m sure was meant to be ‘1/2 cup butter’ as you say in your very helpful video. Also, the ingredient list doesn’t mention salt so an amount there would be useful. Quick question from a cooking novice: how long in advance do you take the eggs out of the fridge for room temperature eggs? Thank you! Definitely supposed to be 1/2 cup Thank you! Hi Gremlin, I’d guess 30-60 minutes is sufficient for bringing eggs to room temperature. To do it in just a few minutes, I put the eggs in a bowl of very warm water. Oh sorry, I didn’t see that part of the question. 30 minutes should be fine! This is in my regular rotation! My non-keto friends don’t suspect a thing. Great recipe! This is the best keto dessert I have made so far. I used blueberries because that’s all I had. I ate a piece warm and it was so moist and delicious. Love this! I just made it with strawberries, and it’s delicious. It’s a beautiful cake texture too! I have a suggestion though…I made an 8×8 rather than the directed 9×9 which allowed me to make a sample size extra in a mini loaf pan. This way my husband and I can make sure it’s as delicious as it looks before we serve it to friends & family. That’s cute, I love that idea! So what does the 1/2 cup of butter contribute?. We made it as published earlier in the week with the “tb” of butter and it seems fine, good. Thanks for the recipe!